We start with 100% all-natural ingredients, always using real butter for rich flavor. We bake our cookies fresh daily and they are shipped from Minneapolis, Minnesota. Enjoy Sofia’s Promotional Products' unique mini bite-size cookies offering indulgence without the guilt. Sofia's offers four classic flavors of cookies to choose from: chocolate chip, oatmeal raisin, key lime pie, and vanilla pecan. Call us today and get your free spec samples to get a taste! 100% all-natural, melt-in-your-mouth, rich butter cookies mixed with milk chocolate chips. Mini cookies made with simple, classic ingredients that will remind you of those from your grandma's kitchen. Bursting with citrus flavor and dusted of powdered sugar, Key Lime Pie Mini Cookies are a crowd favorite. Decadent Vanilla Pecan with real pecan chips baked in. Our daughter Sofia's (the company's namesake) favorite. Enjoy a small bite-sized sugar cookie that is perfect for any celebratory occasion. This assortment of roasted nuts makes for a delicious, healthy snack. Protein-packed! A little bit sweet, a little bit salty, 100% buttery deliciousness—ready to satisfy any craving. A perfect mixture of nuts and fruit. (Salty + sweet) + (protein + complex carbohydrates) = a winning combination. A snack to satisfy any craving! You will be ready for any event with this salty snack. Peppermint hard candies add the perfect pop of color and holiday taste to your gift box. These come in our 8" impact clear and 4" compact clear canisters. Mini pretzel twists with a yogurt coating make for a perfect snack to satisfy those sweet and salty cravings! Crunchy almonds covered in quality dark chocolate - YUM! Rich cranberries coated in yogurt for a perfect holiday treat. Salted white popcorn, caramel popcorn and sharp cheddar popcorn combined together for a mouth watering snack. 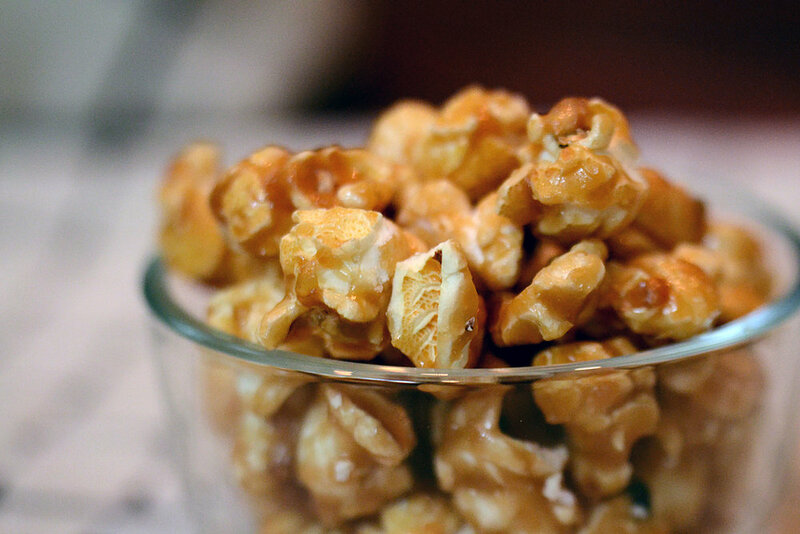 Popcorn, Caramel and Sea Salt - What is there not to like?